In a matter of weeks, on Feb. 20, new Gov. J.B. Pritzker is scheduled to unveil his budget proposal. Pritkzer avoided getting into specifics of during his campaign for the state’s highest office, beyond a promise to move to an income-based progressive income tax structure that would lower rates on the middle class. The new “Restore Illinois: A Foundation for Growth” report from the Civic Committee of the Commercial Club of Chicago recommends other ways of bringing revenue to the state’s beleaguered budget. Among them: a hike in the state tax rate from 4.95 percent to 5.95 percent (raising $3.7 billion annually); a tax on retirement income – something that Springfield politicians have been loath to do given older residents’ propensity to vote (the specific model, which would exempt income up to $15,000, is projected to bring in $1.9 billion); and a tax on a menu of services, to raise $500 million (Illinois currently has a sales tax on material goods). There’s an immediacy to the recommendations. Pritzker’s graduated income tax is years away at the earliest because moving from a flat tax would require a constitutional amendment. The Civic Committee sells its plan as measures that “can be enacted immediately” and therefore immediately begin restoring the state budget and economy. On the other side of the ledger, the Civic Committee members want lawmakers to better scrutinize the budget for ways to spend less. Specifically, the authors want state employees, not taxpayers, to cover more of workers’ current healthcare expenses. And they recommend winnowing the state-paid healthcare benefit given to current retirees, by establishing a new retiree healthcare plan for future state workers. “We support the State reforming and re-designing employee healthcare plans to retain solid benefits for State employees, but make them more consistent with the benefits received by private sector employees,” the report said. At the same time, the Civic Committee’s members – who are ostensibly generally well-off given that the Commercial Club’s membership is comprised of scions of industry and company CEOs – call for eliminating the estate tax, which would ding the state some $290 million a year. 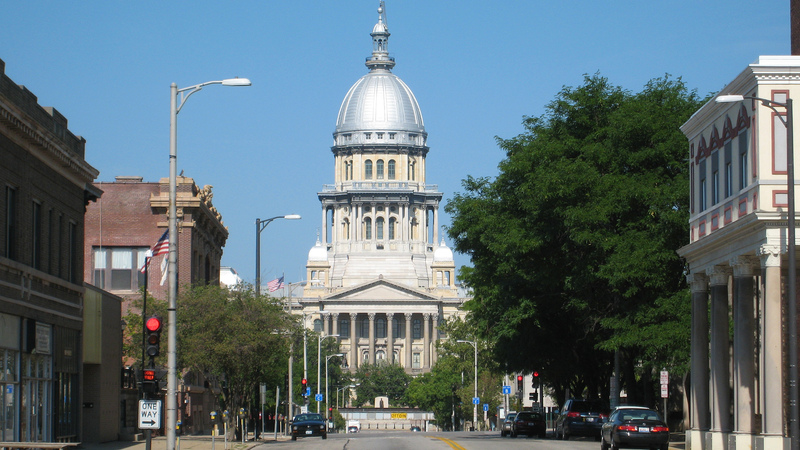 Other recommendations would have more tangential budget ramifications, like calls for local government consolidation and establishing metrics to closer track Illinois’ progress on meeting budgetary goals. The report presses the state to monitor its newly implemented education funding law, by ensuring that $350 million each year is added to state spending on schools. The business-oriented group also wants Illinois to change the state’s workers’ compensation system so it’s less expensive for companies. “Companies often consider the cost of workers’ compensation insurance in a given state when deciding where to locate, making it an important component of a state’s jobs climate. Illinois historically has been a higher-cost state for workers’ compensation premiums and despite improvement stemming from significant reforms enacted in 2011, the State continues to have higher costs than the majority of states. Illinois’ workers’ compensation premium rates are the 22nd highest in the country,” the report reads. Democrats, who viewed former Republican Gov. Bruce Rauner’s call to “reform” the workers’ compensation system as anti-worker, are sure to be in no rush to suddenly adopt that mind-set now that they’re in full control of the statehouse. Leaders with the Illinois Policy Institute say they’re not convinced either. The IPI released its own report Tuesday. “Budget Solutions 2020” calls for a constitutional amendment, increasing education funding and a cap on automatic pay increases for a select number of state workers. “With a recession looming and the economy slowing down, it would be irresponsible for the state to hike taxes,” said Adam Schuster, the IPI’s director of budget and tax research, in a statement. Welsh and Civic Committee Executive Vice President Dea Meyer join us in discussion. Note: This story was originally published Feb. 5. It has been updated.